Yolande Ardissone was born in Normandy in 1927, from a young age she was inspired by the great impressionists of her time, Gauguin, Renoir and Van Gogh. She left Normandy at age 17 to study at the Ecole des Arts Appliques in Paris. Two years later she transferred to the Ecole des Beaux-Arts* and studied in the atelier* of Unterstellar. Her studies paired with her travels around the world brought a greatness to her style. Her works exhibit charming atmospheres and playful arrangements of landscapes, portraits, still lives, street village scenes and her acclaimed boating scenes. Inspired by color and rich texture, she has traveled to Italy, Spain, Algeria, Holland, Indonesia, Egypt, Haiti, China, Thailand, and Russia bringing her inspirations from these parts of the world into her pieces effortlessly. One can feel a wordiness to her touch, and a great enthusiasm for vivid impressionism. She was discovered by the art merchant Wally Findlay in 1957 and started exhibiting her works in New York City, Beverly Hills, Palm Beach and other US-based galleries that same year. Yolande Ardissone has gained a considerable reputation. She loves to paint Provence, Paris and the French countryside. But her favorite topic is the region of Brittany in western France. Her works have been acquired by the Ville de Paris, the Musée de l'Ile de France, the Musée de la Marine, l'Etat, etc. The Ville de Paris has awarded her the Médaille d'Argent. Museums and Exhibitions: Salons annuels de la Jeune Peinture; Salon des. A vivid depiction of boats docked at the harbor with a lighthouse in the distance and houses along the water. Yolande was mostly known for her playful and sophisticated paintings executed with thick use of paint and sporadic, yet controlled brushwork. Her wonderful use of light and shadow is exhibited beautifully as we can feel the time of day and the atmosphere. 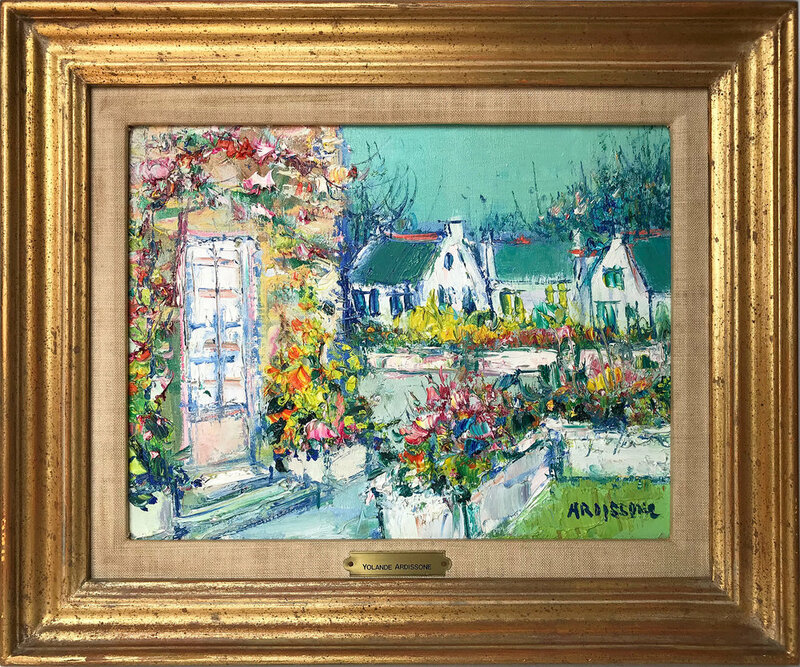 This painting is signed lower left and comes displayed in a charming gold tone frame with hanging wire on verso.